Suction Blast Gun, No. 7, 7/32" Air Jet, Includes 7/16" (#7) Ceramic Nozzle. Suction Sand Blast gun directs a high-speed mixture of air and abrasive to quickly remove corrosion, mill scale, coatings, heat treatment residue, carbon buildup, tool marks, and burrs. The air jet at the back of the nozzle directs a high-speed stream of compressed air through the mixing chamber and out the nozzle. The rapid passage of this air generates negative pressure, causing blast media to flow into the mixing chamber and out the nozzle. This technology is widely known as venturi or suction blasting. The operator holds the Suction gun at a predetermined distance and angle, relative to the surface being blasted. The Suction blast gun can clean, finish, or peen the part being blasted. By moving the gun and the part, the operator quickly covers as much of the surface as needs blasting. No. 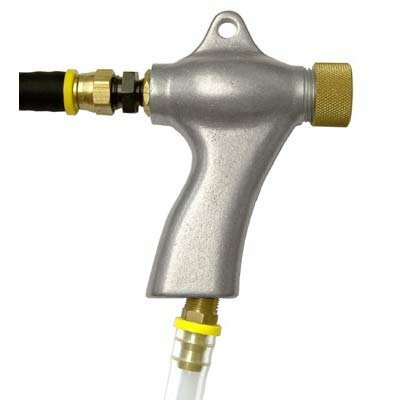 7 (7/16" Bore Dia Nozzle) Suction Blast Gun gun keeps the air jet and blast nozzle precisely aligned to maximize blast efficiency and minimize gun-body wear. High-performance blast gun provides comfortable grip for operator, and allows precise control of blast pattern. Works with most recyclable blast media - glass bead, ceramics, aluminum oxide, and some sizes of steel grit and shot. Select appropriate blast media for your application. If you have any questions about this product by Blastline USA, contact us by completing and submitting the form below. If you are looking for a specif part number, please include it with your message.